It’s been impossible to escape these last few days: Facebook newsfeed changes are coming and that’s bad news for business, democracy, and brands. After the announcement, Mark Zuckerberg’s personal net worth even decreased by an estimated $3.3 billion. There’s been a lot written already, but it has been difficult to make sense of it all. This week we’re answering your questions on how Facebook’s newsfeed changes will impact publishers. In short, Facebook has announced it intends to prioritise posts from family and friends in user newsfeeds, over posts by pages. 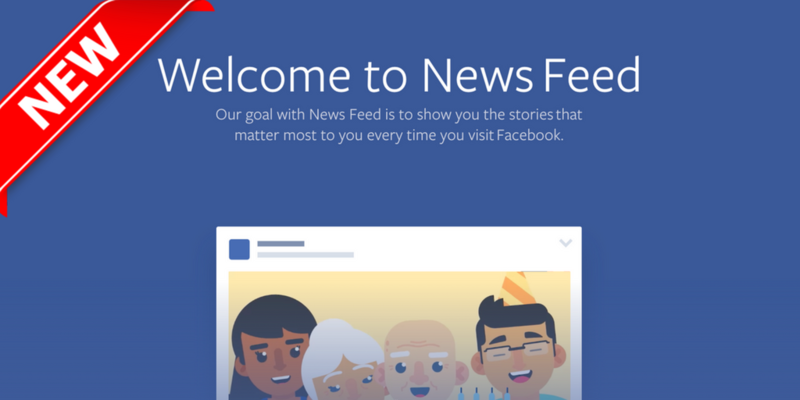 Facebook estimates that the amount of news in people’s feeds will drop by 20% on average. This will affect publishers that rely on Facebook to reach their audience. Last year when Facebook experimented with putting publishers’ stories on a separate newsfeed in 6 countries, affected pages reported drops of 60-80% in Facebook engagement. For now, the trustworthiness score will only apply to US publishers, but Facebook has announced it plans to roll this feature out internationally in the future as well. Still, this led News Corp executive chairman Rupert Murdoch to release a statement proposing that Facebook should then pay media companies deemed legitimate by its survey for their content, helping to combat the problem of fake news on its platform. Additionally, Facebook has begun testing a separate feed especially for local news, called “Today In“. As of now, this is only available in 6 American cities, and it provides news from regional publishers chosen via an algorithm as well as picked by Facebook’s news partnership team. Mark Zuckerberg has given a few reasons for this change, writing that the increase in news articles is “crowding out the personal moments that lead us to connect more with each other”. Facebook’s research has shown that people are happier when they use social media to connect with people they care about instead of reading articles or watching videos, even if they are entertaining. Of course, the changes may also be in response to the many controversies Facebook has faced in recent years–most notably is its role in the spread of “fake news” during the 2016 US presidential election. Yet some are worried that this change will only serve to encourage the spread of misinformation. In mid-2017, Google search surpassed Facebook as the top referral for publishers and since then Facebook referrals have continued to decline, while a Reuters study found that publishers were least positive about their relationship with Facebook. Some publishers have already de-emphasised their reliance on Facebook. In a survey from Nieman Lab, many publishers said they had already prepared for this or that at least Facebook wasn’t as important to their strategy as it once had been. Readers themselves have also shown a decreasing interest in Facebook as a source of news. 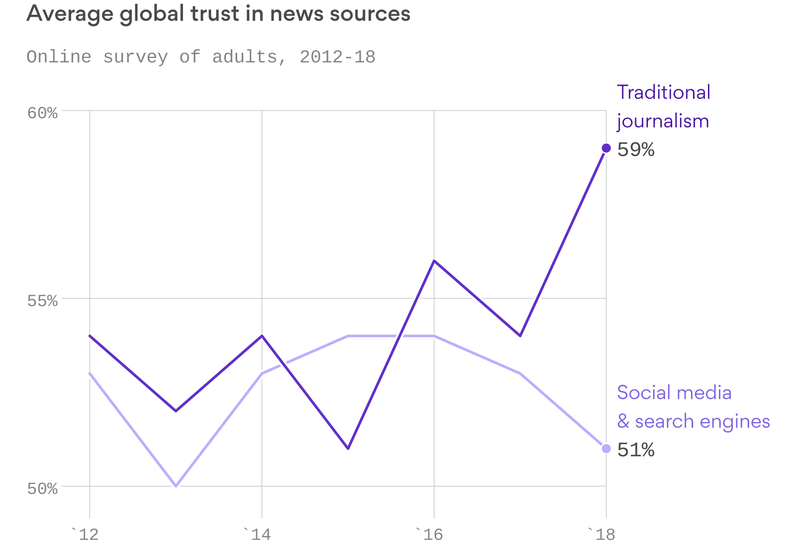 Globally, readers place more trust in traditional journalism than social media platforms, with trust in journalism reaching a 6 year high. Should we pivot to groups? When Facebook first allowed pages to create groups, we saw some publishers experiment with this new platform. The Boston Globe’s Facebook group for subscribers launched about a year ago and has seen nice results, with over 3,000 members and posts receiving more than twice the number of comments as on the page itself. But just like the hyped ‘pivot to video’ of recent memory, a pivot to Facebook groups isn’t for everyone. Before deciding to focus on groups, make sure you consider your newsroom and audience. If your audience is already on Facebook, this can be a great way to engage them directly with your content, but it shouldn’t be that you must first get your readers on to Facebook. It’s also important that you have the resources for moderating the group to make sure it isn’t overrun with spam and non-relevant posts. While eventually the goal is to have the group be self-sustaining with readers doing most of the posting, it might be necessary to generate conversations in the early days. We’ve seen some publishers telling their readers how to keep news articles in their feed by marking them as ‘see first’ or directing readers to their own app. Savvy publishers will focus more on social sharing, as articles shared by friends will still appear in users’ newsfeeds. This might take the form of optimizing the sharing buttons on your website, but just make sure to not fall victim to ‘engagement bait’. Facebook will deprioritize publishers it sees relying on engagement bait, which includes such things as writing by “share this” or “tag a friend” on your Facebook posts. For how to avoid falling victim to engagement baiting, RJI’s Trusting News project has a great write up with best practices on how to deploy your fans. Facebook will also deprioritize the least engaging publishers, so make sure to post only your best articles–meaning that posting non-engaging content can hurt even your most engaging content. Facebook’s renewed focus on building local community can be seen as a positive change for regional publishers. Plus, some have posited that this change could be the push publishers need to focus more on engagement than on scale. So don’t despair, there is hope for a world after Facebook newsfeeds. When Norwegian daily Aftenposten made this switch, from chasing Facebook reach to focusing on subscribers, they brought in an extra $500k annually. They found that Facebook likes, comments, and shares had no impact on reaching their business goals. Still confused by how these changes will impact you? Send me your questions! This entry was posted in Industry news and tagged Digital publishing, Digital Strategy, Facebook. Bookmark the permalink.